Resnik Skin Institute, Aventura Florida - Barry I. Resnik MD - Warts � Kissed any Frogs Today? Home Patient Info Medical Therapies Warts � Kissed any Frogs Today? Warts - Kissed any Frogs Today? Warts are harmless outgrowths on the skin caused by human papilloma virus (HPV) infection. They grow on all body parts including face, fingers, feet, legs, hands, knees, inside your mouth, and on the genital and rectal areas. 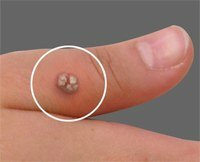 Common warts - appear on fingers, hands, knees and elbows; small, rough, greyish brown fleshy bumps with or without black dots. Plantar warts - appear on the bottom or soles of your feet; light brown bumps with tiny black dots in them. Genital warts - these appear on the genital and rectal areas and are sexually transmitted. Flat warts - these appear in places which are frequently shaven; they are smaller and smoother than other warts and can be pink, brown or yellow and can appear in clusters. Warts can spread from one person to another with skin contact. Warts may also spread by using towels or other personal items which have been used by a person with warts. Warts can bleed if picked or cut and can cause pain, especially plantar warts. Warts will be diagnosed by simple observation of the lesions. Your doctor may scrape the top layer of the wart and check for clotted blood vessels and at times a biopsy may be ordered. Warts disappear naturally but may take months or even years to disappear. Warts can be treated with different type of chemicals such as salicylic acid, liquid nitrogen to freeze the warts,, and also by laser treatment. Applying salicylic acid once or twice a day will help you to destroy the warts. If the warts do not heal then they may be removed surgically. Warts can recur even after treatment is used to remove them. Cantherone: It is a medicine derived from the Japanese blister beetle, is applied with a Q-tip on the warts. It causes a blister at each site and after sometime warts are destroyed. This treatment is very effective for most warts and is painless. Bleomycin: It is an anti-cancer agent is also used. Pulsed dye laser is magnetized to the blood vessels which feed on warts, and carbon dioxide (CO2) lasers are also used for warts. For more information from the American Academy of Dermatology.